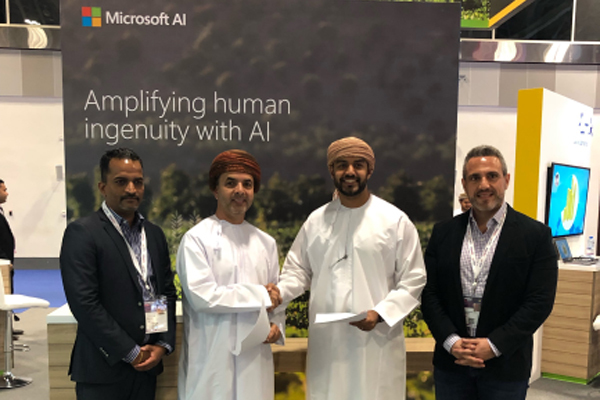 Microsoft, a leading technology company, recently signed memorandums of understanding (MoU) with two organisations dedicated to strengthening Oman’s technology skill base and entrepreneurial spirit, at Comex 2019, held in Muscat. The event, which opened on March 17 will conclude later today (March 19), at the Oman Convention and Exhibition Centre. “Digital transformation’s power to engage, empower, optimise and reinvent is an important tool for entrepreneurs and their leadership teams. We must ensure that people with the right skills stand ready to take their places in the country’s digital future,” he added. Microsoft also announced that it will work with nationally renowned training institute Oman Technology Institute (OTI), a subsidiary of Oman Line, to up skill the sultanate’s higher-education students and graduates in cloud computing, with a strong focus on artificial intelligence. Microsoft will advise OTI on the best partner fit for building training programmes that the institute will offer on its Learning-as-a-Service platform. OTI will focus on creating competitive, well-versed professionals who go on to bolster the nation’s digital transformation culture that is currently underpinning Economic Vision 2020 and Vision 2040. Microsoft will further support OTI by offering internships to certain trainees. The duo will additionally collaborate on the formation of a national professional-certification programme designed to formalise the skills of new professionals. “As we step forward into our shared digital future, the responsibility of educators is clear. Digital transformation is ongoing; and filling important skills gaps with competent professionals should be the goal of every training institute,” he added. The second MoU Microsoft signed was with Omani venture capital group, Phaze Ventures. The two will work together on multiple schemes to promote and accelerate the growth of the country’s small-business and start-up ecosystems. Microsoft will support SparkLabs Energy, a startup accelerator programme created by Phaze Ventures that focuses on ambitious digital disruptors in the energy industry that are focused on areas such as renewables, water management, Industrial Internet of Things, enhanced oil recovery, data analytics and logistics. Additionally, Microsoft will assist with Phaze Education, an initiative that organises coding bootcamps, hackathons, and a variety of training courses, lectures and competitions for the purposes of offering upskilling in key technologies to entrepreneurs and start-up leadership teams.